Gouvion, wire of a tanner, is only three years old when his/her mother leaves the residence. After a voyage two years in Italy, he becomes Master of drawing, in Toul then in Paris. In 1792, it decides to engage in the republican army. It is there that it adds Saint-Cyr to his name, to be distinguished from his/her cousins. It fights in the Army of the Moselle. It intelligent, is informed, able, it has an excellent blow ofœit; Gouvion-saint-Cyr climbs the military levels quickly. June 16, 1794, it is already major general, a record of speed. It controls a division with the Army of the Rhine-and-Moselle and is distinguished with the seat from Mainz. In 1798, it receives the provisional command of the Army of Rome, which invades the Papal States and creates the Roman Republic. Gouvion brings back the discipline in the row of the officers, who have just relieved Masséna. It is pointed out on July 26, 1798. It is useful in the Army of Italy and takes part, under Joubert, with the battle of Novi, August 15, 1799. After the battle, it manages to make the junction with the remainder of the army. Quand Masséna comes to replace Joubert, killed with Novi, Gouvion obtains to be affected with the Army of Italy and beats the Austrian armies. For his exploits in Italy, Bonaparte decrees to him the patent of first lieutenant of the Army and a sabre of honor. Affected with the Army of Germany under Moreau, it seizes Freiburg and takes part in the battle of Hohenlinden, December 3, 1800. In 1801, it is charged to assist Lucien Bonaparte in Spain. Two years later, he is a lieutenant of the occupying army in Naples, under Murat. However, it appears a little too independent on the political level with the taste of its superiors. In 1804, it will not be made marshal, but becomes colonel-General of the cuirassiers. In 1805, it is useful in the army which must subject the kingdom of Naples, whose Joseph is the new King. IL controls an army corps during the program of Poland of 1807. In 1808, one entrusts the command of VIIème body to him, with white card to operate in Catalonia. Gouvion-saint-Cyr aligns victory over victory. In spite of the lack of artillery and ammunition, it manages to take the fort of Pinks on December 4, 1808 and Barcelona. It then receives commands which it considers unrealizable, learns its replacement and leaves its station prematurely. This new mark of independence is worth the stops to him and new forty. EN 1811, Napoleon recalls it to the Council of State and entrusts to him the command of VIème body of the Grande Armée. Gouvion-saint-Cyr gains battles; he demolishes in particular Wittgenstein with Polotsk, August 7, 1812 and receives the stick of marshal. March 1813, sick, it re-enters to Paris. Controlling an army corps, it takes part in the battle of Dresden (August 26-27, 1813). Napoleon entrusts the defense of the city to him, but with court of food and ammunition, it capitulates on November 11, 1813. He is a prisoner until June 1814. When it returns to France, Louis XVIII is on the throne and A named Pair of France. With the return of Napoleon of the island of Elba, Gouvion, in Orleans, makes carry the white rosette to its men. 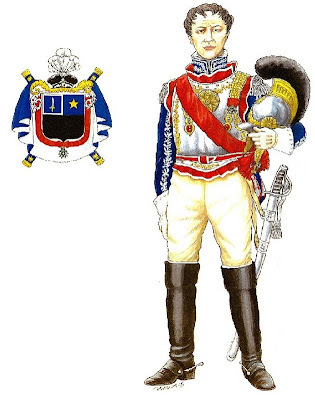 Laurent Gouvion Saint CyrRepresented here with the uniform of Colonel General of the Cuirassiers, personally studied for him to wear during the ceremony of the "Sacre", when Napoleon self proclaimed Emperor. Talented artist, painter, student of the Roman Empire and fine arts, and also actor of theatre, he began the military career as drawer of maps for the French Army.